This recipe makes four portions of an Italian classic made lighter with zucchini noodles and ground turkey. Just prepare it all on Sunday evening and put them in the fridge for grab-and-go lunches during the work week! The mouth-watering meatballs are made with ground turkey, egg, bread crumbs, Parmesan cheese, salt, oregano, basil, parsley, black pepper, garlic powder and red pepper flakes. 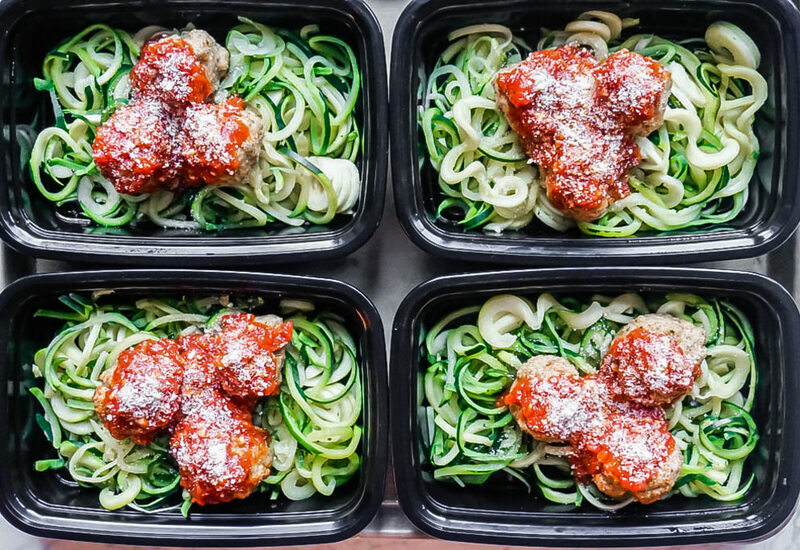 While the meatballs are roasting, cook up your zucchini noodles and you are all set! Want to take this recipe a step further? Make your own simple and delicious homemade marinara sauce for a an additional fresh boost! It's perfect when tomatoes are in peak season during the summer months. Per Serving: 498 calories; 28g fat; 22.7g carbohydrates; 40g protein; 267mg cholesterol; 1674mg sodium. I'm always looking for different meal prep ideas to make my husband, but he's sometimes a picky eater. I'm so glad I stumbled upon this recipe because I made it for him and he loved it! The ground turkey meatballs are so delicious, I made an extra batch for myself. The spiralized zucchini is a lighter alternative to pasta, so it's not too heavy. I'm glad that found something that works for both of us! I was looking for a healthy dish using ground turkey and came across this recipe. It was really good, perfect for me to take to lunch. I made these meatballs but used ground chicken instead of turkey. It’s the perfect meal prep that I don’t get bored with. I usually do it M-Thursday and then Friday eat out with my co-workers. It’s the healthy eating throughout the week incentive.